In many areas on Earth that get winter snow, spring thaw is a messy time. Frozen ground turns to mud, and there may be runoff everywhere from melting snow and spring rain. Or if you live in a place that gets winter rains, spring might be the time when mudslides are most common. 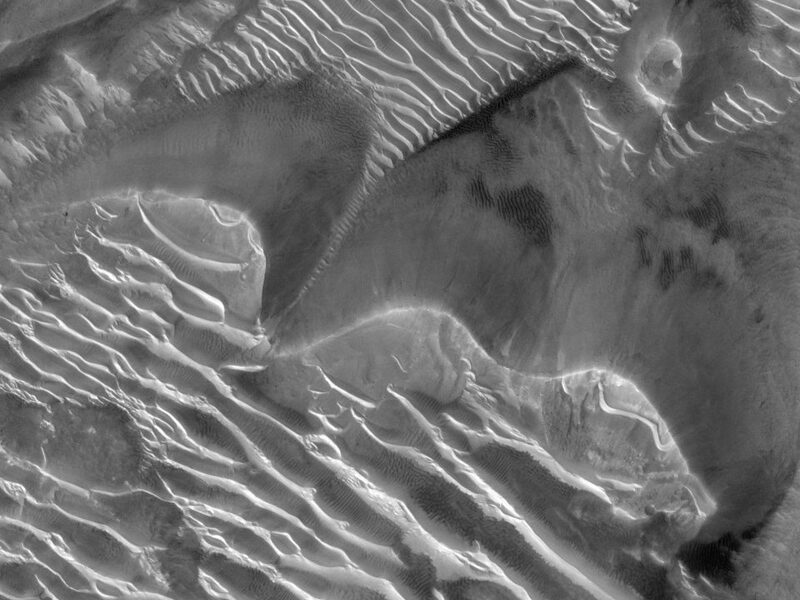 Spring can be messy on Mars too, although in this case the ice isn’t H2O, but CO2. Also, it’s not melting, but rather sublimating. But that can still make a big mess. 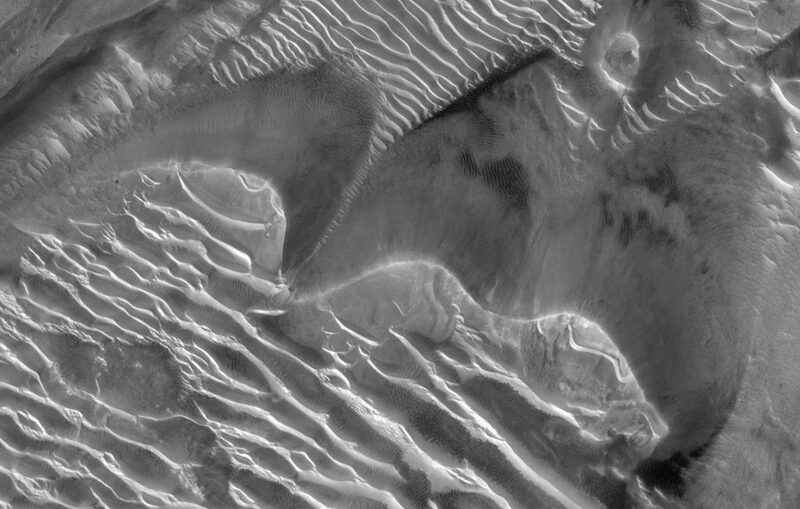 Here’s part of a dune field in early spring, located in the high southern latitudes. 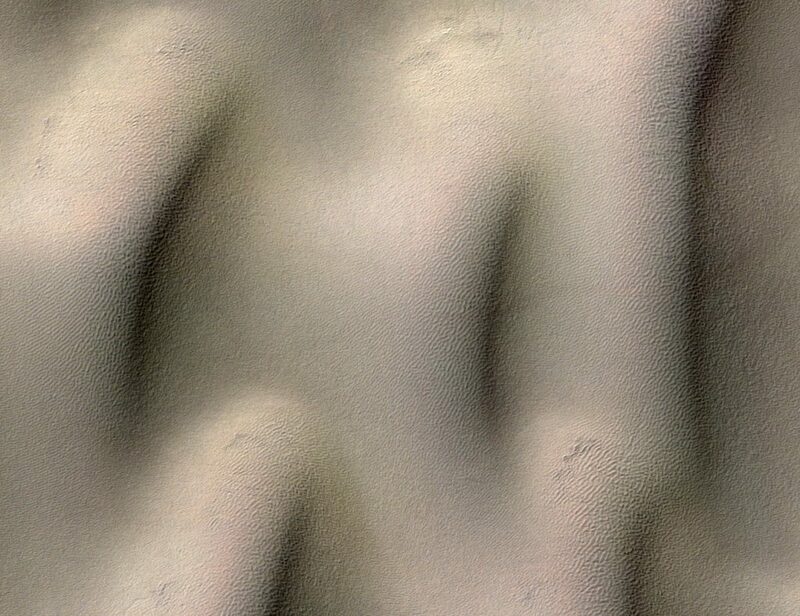 Normally dunes on Mars are dark because they’re made of dark sand, but here they’re still mostly covered by bright wintertime frost. If you didn’t already know there were dunes here, you might never guess that’s what’s there. 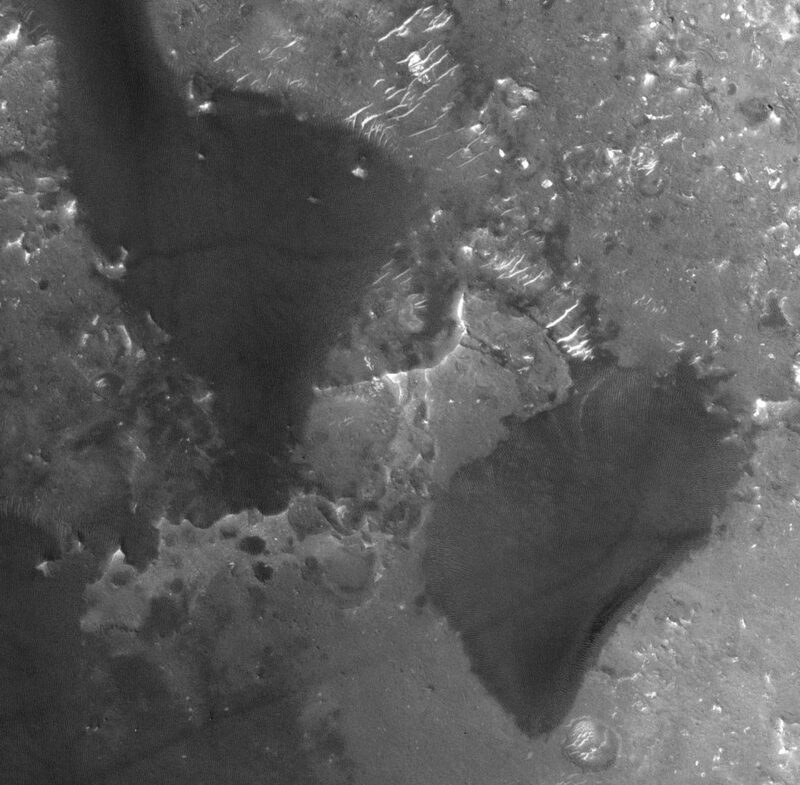 Zoom in (click on the image) and you’ll see the ice is draped over sand ripples. 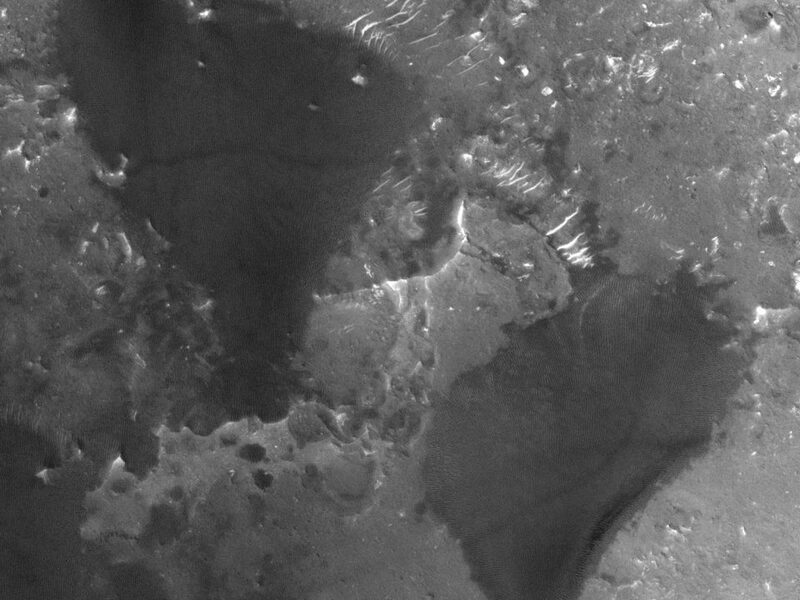 View is 1×1.25 km (0.62×0.78 mi), HiRISE ESP_055591_1150, NASA/JPL/Univ. of Arizona. 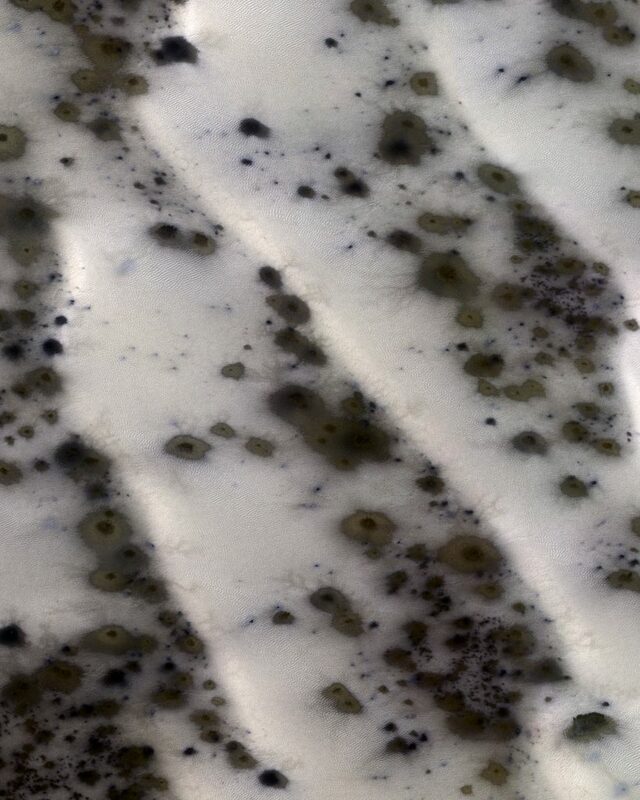 What about the weird brown and black splotches? Those form in the spring as the white ice begins to sublimate (Mars air is too thin to let ice melt, so it skips that step and goes right from ice to gas). 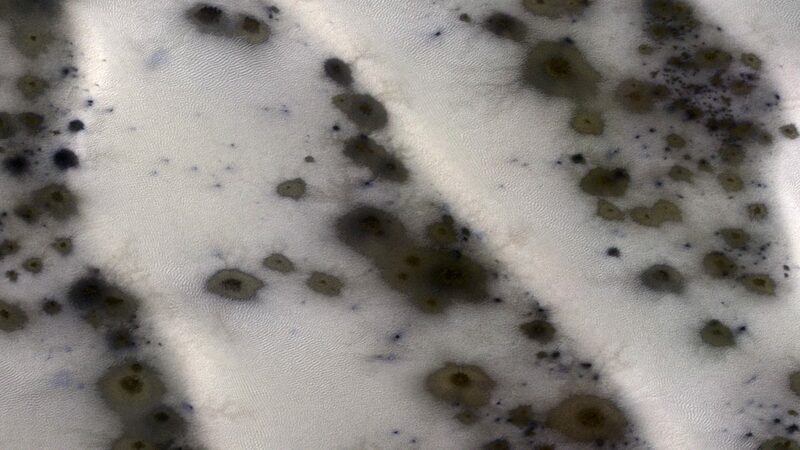 The dark areas are places where the frost is thinner, or maybe just more easily sublimated for whatever reason. They’re dark because some of the dark dune sand underneath the ice is starting to show through. Those spots are characteristic of dune sand in the spring. Eventually they grow and coalesce until all that’s left of the winter ice are little bits that cling to the shady slopes, until those bits too finally disappear. In the meantime, there’s a wild mess for the winds to sweep up later on, if they can.